Birth trauma attorney Jeffrey Killino has extensive experience with all types of birth trauma cases and highly knowledgeable in the law as well as the science of medical negligence or malpractice. If your child has sustained a birth trauma injury and you believe the injury may have been caused by medical negligence during your labor or the delivery of your child, you may be entitled to legal compensation for your child’s injuries. Contact birth trauma lawyer Jeffrey Killino at 877-412-8490 for a no-cost evaluation of your case and more information about your legal options. Birth trauma injuries may be caused during a woman’s labor or the delivery of her child by the negligence of doctors, nurses, or other medical personnel assisting in the child’s birth. They may also be caused by the negligence of the hospital in which the baby is born through inadequate childbirth procedures and other carelessness on the part of the hospital. Birth trauma injuries are frequently caused by the negligence of those who assist in the birth of a child. Obstetricians or other physicians, as well as nurses and others, have a duty to exercise reasonable care for the safety of mother and child during the pre-delivery, delivery, and post-delivery stages of a child’s birth. The vital signs of both mother and child should be monitored closely from the time the mother is admitted to a hospital and should be continually monitored throughout the childbirth process and immediately after for any signs of distress in the mother or fetus. The failure to properly monitor and recognize such signs may result in serious injury or death to a fetus. Problems with fetal heart rate or breathing, for example, may require emergency intervention to save a baby’s life. Evidence of nuchal cord (the wrapping of the umbilical cord around the baby’s neck), or compression of the umbilical cord, if not timely and properly managed, may lead to asphyxia injuries or death of a fetus. Such asphyxia injuries include cerebral palsy and HIE (Hypoxic Ischemic Encephalopathy), both of which are brain injuries caused by a lack of oxygen to the fetus. Additional birth trauma injuries may occur when a baby’s shoulders become stuck behind the mother’s pelvic bone as the baby moves down the birth canal, a complication known as shoulder dystocia. Shoulder dystocia often occurs when a fetus weighs more than average for its gestational age (fetal macrosomia) and cannot easily fit through the birth canal. The failure of medical personnel to diagnose fetal macrosomia or other conditions that may lead to shoulder dystocia may result in serious injuries to the fetus, many of which may be caused by the negligent pulling by obstetricians or others on the baby’s head or neck in an attempt to free the baby’s shoulder from behind the mother’s pelvic bone. Both Erb’s palsy and other brachial plexus palsies may result from this negligent pulling of a baby’s head and neck and may lead to debilitating and life-long damages for the child. The failure to timely detect fetal macrosomia may also lead to an inadvisable vaginal delivery when a Caesarean section should have been ordered. The failure to order a Caesarean section when the baby’s safety may depend on a C-section rather than vaginal delivery, or the untimely performance of an ordered Caesarean section, may also lead to liability on the part of the responsible physician or other medical personnel for the baby’s resulting injuries. In some cases, birth trauma injuries are caused by poorly maintained equipment utilized to assist in a child’s birth, such as forceps or vacuum devices. If a hospital’s negligent maintenance of such equipment is found to have been a cause of a child’s birth trauma injury or death, the hospital may be found directly liable for the baby’s injury or death. In addition, if the equipment contained a defect that caused a baby’s injury or death, the manufacturer and others in the chain of the equipment’s distribution may be found liable for a baby’s injury or death that is determined to have been caused by the equipment defect. Many birth trauma injuries are caused by medical negligence during the delivery of a child. 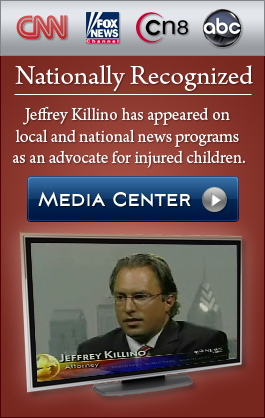 Birth trauma injury attorney Jeffrey Killino is known throughout the United States for his considerable expertise and experience with all types of birth trauma cases and his dedication to bringing those responsible for such injuries and deaths to justice. Contact Child birth injury attorney Jeffrey Killino at 877-412-8490 for the best in representation for your birth trauma case.